We have continued with the weening from breast milk to formula. As of today, we are now doing 6 formula feeds to about 4 breast. Unfortunately, the weening process has had a nasty side effect for Callum. He developed a bit of constipation and really struggles to go to poo (I can't believe my life has been reduced to talking about my sons toilet - or should I say nappy - habits!). Gets a bit worrying when he hasn't been for a couple of days and he cries out in pain as he strains to go. At one point all he was getting for his efforts were the most horrific smelling farts!!! It is getting better again now but he still struggles and gets upset. Fine during the day but not so fine at night. It tends to only happen between 3 and 6am so I tend to put him in the nursery during this time as he is still sleeping but just cries out. This way, I can still sleep and only wake up when he cries for feeding. It is also a good way of getting him used to sleeping in the nursery for when he moves in there full time. I'm starting to think about when to start putting him in the nursery for his naps during the day - now that they are slowly starting to become naps rather than the norm. However, sayi ng that, he does still sleep more than he is awake. He tends to spend 1-2 hours in the morning and then 2-4 in the evening awake. I've had some lovely times during the awake periods where he is trying to smile and is fascinated at looking at my face and listening to what I am saying or the noises I make - see the video clips. The clips are actually not good examples because he isn't smiling in them. In fact, he nearly cries a couple of times in one of them. I have therefore published a picture of him smiling to prove he does enjoy it too. Still not in any real routine and there are still bad nights and good nights. My mum came to stay with us for a few days last week. She came on Wednesday night and went on Sunday morning. It was lovely to have her here and I got some 'me' time - I actually got to have my hair cut!! I was sooo excited about it and it desperately needed doing. Stuart and I also got some 'us' time. We went out for a meal sans Callum and had a couple of drinks in some of the local bars (yes it was a mini pub crawl) after. I was shocked to see I still had some alcohol tolerance, fully expecting to be drunk after dinner. However, I managed to have a glass of wine before we left, half a bottle during dinner and 3 vodka and cokes and was only a little bit tipsy!!!! I shouldn't really be drinking of course while I'm breastfeeding but I have heard from many professional sources that you would have to drink a lot of alcohol for it to get through to the breast milk and the greater risk is of it drying up your milk supply. I hope that is true otherwise I'm such a bad mummy - smack hand! Despite the above, in some ways I feel we took a step back with Callum, as he started to get used to being cuddled more and not going down in his moses basket until he was cuddled to sleep, and then sometimes still he wouldn't go down . Also, I got less done and was slower to get ready because I kept talking to mum. It took me twice as long to do anything. My fault, obviously, not my mums. And I had already started the issue of cuddling Callum to sleep so need to take responsibility there too. 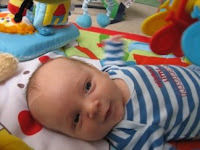 I have my 6 week check up tomorrow to see if I am all ok following birth and to check Callum over too. Will write again about how that goes after. Stuart was really helpful over the weekend. I'm not sure whether it was just because my mum was here or whether it is to continue. He even did stuff voluntarily without being asked....and got up at 5am with a hangover to see to Callum and feed him. This must have been really tough! (I mean that by the way, I don't mean it to sound sarcastic). It also made me realise how much he does do anyway. I know it should go without saying with the amount mums need to do while dads are at work (or vice versa if dad stays at home and mum goes off to work) but I also need to recognise how much more he does than some other dads/husbands. I should count myself very lucky. I feel like I'm very quick to criticise all the time with him going out and forget to recognise when he is lovely. I'm not saying I feel differently about him going out and I still stand by what I said but what he does the rest of the time goes towards making up for it. I think, now that we are moving over to formula, I will be more relaxed about him going out. I would still prefer him to ask me to go out like I would expect to do myself when I want to go out (as I say, the responsibility of looking after a child should be equal and there should be no assumptions that the other half would be happy to always be the one to 'babysit' without even being asked) - but rather than saying I don't want him to go at all, perhaps we can each have a night each every other week. And then once a month, we could try to have a night together. Best get looking for a babysitter!! !